Deana Cressler Elanis known as Leeray, is celebrating her second birthday. As is usual in the Philippines, she is known there by only her nickname. Often the children don’t remember a person’s real name when I ask them. She is the one that I have mentioned that has a skin condition that requires medication. Fortunately, she seems to be gradually growing out of that problem. 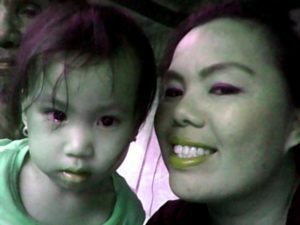 A few weeks ago, Inday called her from playing to take a picture of her using the webcam on the laptop. This is the only camera that they have right now. A Big Happy Birthday to Leeray! I’m hoping to wish her birthday wishes tomorrow if we can get through. Due to brownouts, it has been almost a week since we have been able to make connection. I will forward your greetings and wishes. The children think it is so special when I tell them that someone has made comments about them.